Purchasing a GPS device is beneficial for a number of reasons. Not only is it nice to know where you're going and how long it's going to take to get there but there is also the increased security of knowing that if you are in an accident or get caught in bad weather you will be able to readily identify your exact location. For cyclists attaching a GPS receiver to your bike is very straightforward with many manufacturers now selling bike mounts that you can simply attach to the front of your bike. All models are generally fairly rugged, waterproof machines that can take a few bumps and nasty weather conditions without any problems. Below are some of the most suitable GPS devices for walkers and cyclists. 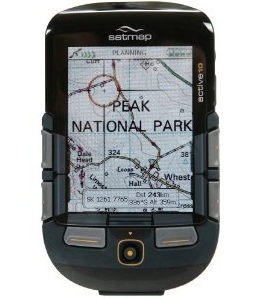 Many smartphones now come with integrated GPS which can be a cheaper option for many people. It also means you can use mapping software such as Memory map which you may already own or download maps directly from the web. Also of interest is the Memory Map app for iphone which is mentioned below, turns your iphone into a fully functional outdoor GPS device. The downside is that these devices are not as rugged as dedicated GPS models although you can use casing such as Aquapac to waterproof your phone. Memory Map have a number of models with built in Ordnance Survey mapping and accompanying bike mount. All models are robust and waterproof. The memory map software is also excellent with the full range of ordnance survey maps available for use on your pc and on the Adventure GPS device. There is also an excellent Memory Map app for your iphone which turns your iphone into and outdoor GPS. 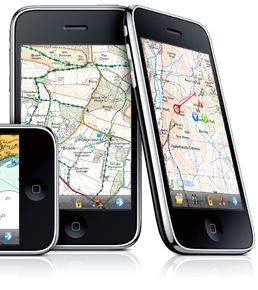 You can purchase and download detailed ordnance survey maps directly through your iPhone. Please click here for product descriptions including video presentations of the products. 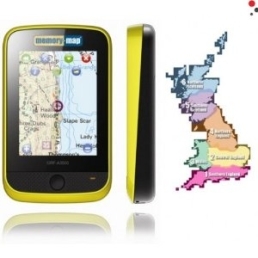 Sat map Sat Map is another fine option for the outdoor enthusiast being purpose-built for outdoor use with weatherproof and shockproof casing. They have an extensive range of maps (including ordnance survey) which are supplied on map cards that plug straight into the GPS device. The interface is also impressive with an 8 way joystick and multi function soft keys. Again for cyclists the satmap comes with a bike mount. This splendid Outdoor GPS app allows you to choose from a massive range of mapping and give you all the trails, terrain and street level detail that you need. You can plan your own route or find one from the database of expert and user generated trails. Garmin are one of the leading manufacturers of GPS units with several receivers suitable for walkers and cyclists. The etrex series is a good, solid affordable option and can be purchased with a bike mount. A bike mount is also available for cyclists. Magellan is another leader in the GPS market with an extensive range of outdoor devices to choose from. The Explorist range contains a number of suitable devices with an easy to install bike mount a popular accessory.